Having arrived on the Endeavour during Maguire’s earlier series, The Odyssey of Captain Cook, the ancient Greeks have resolved to settle New Zealand. Herakles, the archetypal muscle-bound hero of Greek mythology, is cast as colonist and in that role claims and tames the New Land; transforms it as part of the persistent influx from the West. Fathered by Zeus himself, Herakles was originally given a list of twelve tasks by King Eurystheus. Not only did he successfully complete these labours but he also performed many ‘deeds on the side’ before finally being granted immortal status. Maguire mostly draws Herakles in the style of black-figure vase painting from Athens 550–500 BC, in which his silhouetted profile is easily identified by his trademark lion-pelt and heavy club. But she also personifies him with a Maori face borrowed from a French lithograph of the 1820’s. By omitting the facial tattoo and adding the lion-skin the face becomes that of the hero. No longer a cartoonish character labouring comic strip fashion, his image is humanized, his role and identity complicated. In this series Maguire gives Herakles a new set of labours and whether he is clearing forests, battling with Maori warriors, writing letters home, or standing up to be counted at Gallipoli, Herakles appears well focused on the tasks at hand. His renowned strength, fortitude and invention would have advantaged any pioneer however the Arcadia of his dream is within no easy reach. To set the scene for these narrative works Maguire has combined borrowings and re-workings of earlier images - historical lithographs, pre-colonial drawings, old photographs, and the art and text of classical vases - to present layer upon layer of detailed myth and meaning, reference and allusion, appropriation and reinterpretation. Born in Christchurch, New Zealand, 1962, Marian Maguire graduated from the University of Canterbury in 1984 and in 1986 studied at the Tamarind Institute of Lithography, Albuquerque, USA. During 1991 she was Artist in Residence at the Otago Polytechnic School of Art and in 2010 was Artist in Residence at Tylee Cottage, Whanganui. She received an Award for Excellence from the Canterbury Community Trust in 1998. 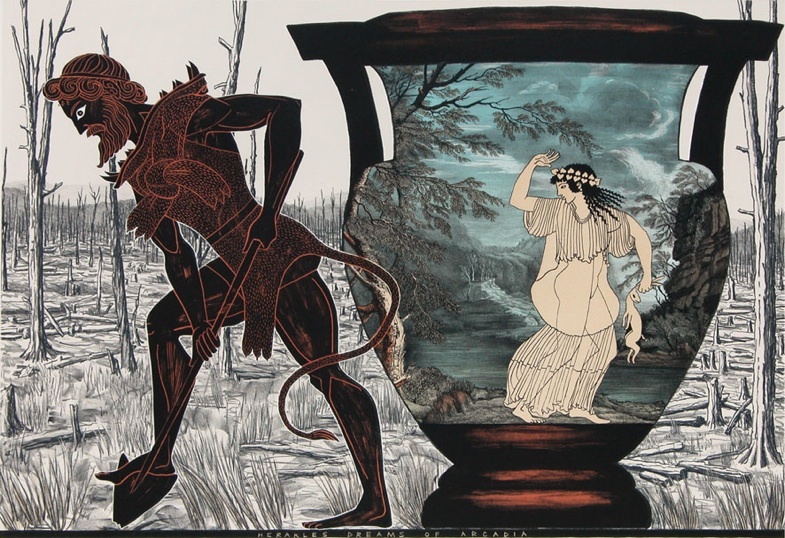 Since 1997 her prints and paintings have frequently referenced Greek vase painting. They mix the imagined with the real and display a personal response to New Zealand history. Her recent major series include Southern Myths (2002), The Odyssey of Captain Cook (2005), and The Labours of Herakles (2008). Marian Maguire has exhibited widely throughout New Zealand and her work is represented in public collections including: Te Papa Taongawera, Museum of New Zealand; Auckland Art Gallery, Toi o Tamaki; Christchurch Art Gallery, Te Puna o Waiwhetu; The Waikato Museum, Te Whare Taonga o Waikato; University of Canterbury; Massey University; The Hocken Collection, University of Otago: Ministry of Foreign Affairs and Trade; National Gallery of Australia; Central Queensland University, Australia; Cambridge University, United Kingdom; The Birthplace of Captain Cook Museum, Middlesborough, United Kingdom.